Download our current sponsor pack now! - we need your financial support to deliver the festival this year! Need our logo? - get it here in various formats. 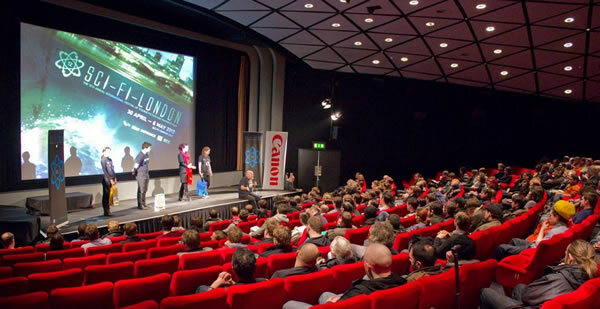 Now in its 17th year, our London-based annual international film festival enjoys an unrivalled reputation as a launchpad for genre film, a credible forum for industry events and networking, and a stimulating, inclusive environment for audiences. Insider, outsider, all are welcome at the friendliest festival in town. Always keen to challenge stereotypes and push the definition of what 'sci-fi' means, we have a reputation for programming a variety of exciting and independent films whilst remaining fun and inclusive. The festival brings together the best science fiction and fantastic film from around the world. Our artistic programme includes international features, documentaries, short films, animation and filmmaking events and a host of related industry workshops and networking events combine the best of ‘science’ and ‘fiction’. We celebrate the shared experience of cinema in our all-nighter programmes and have plain old fun with our costume parades, and pub quiz. We champion UK filmmaking via our 48 HOUR FILM CHALLENGE – judging panellists have included world-renowned industry directors, writers and producers such as John Landis and Guillermo del Toro whilst our alumni include Gareth Edwards whose career in features (Monsters, Godzilla) was kickstarted by his challenge win. We are also proud to promote film literacy for young people in our children's screenings and Q&As. The SCI-FI-LONDON film festival was created by the Festival Director, Louis Savy, "because there wasn't one". "The festival started primarily because there wasn't anywhere for low-budget, interesting or foreign science fiction films. Its purpose was to show films that you're not likely to see in the UK at all, or that are going to be difficult to get hold of," says Louis. Full line-ups archived here: previous SCI-FI-LONDON editions.